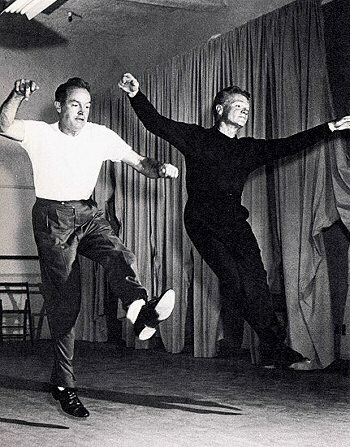 "High point is a Friar's testimonial dinner to Foy in which James Cagney as George M.Cohan,exchanges kidding insult-on-the square with hope, then both swing into a lovely, graceful soft-shoe challenge routine to the tune of Cohan's "Mary." 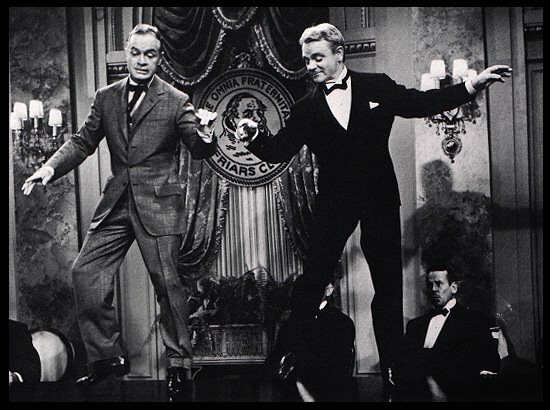 the sequence captures all the hard-shelled sentimentality of the old pros,emerging as a warming tribute to Foy and Cohan from two latter-day pros,Hope and Cagney"
Cagney played a cameo bit as George M. Cohan , he lost 15 pounds and rehearsed for three weeks with Hope.Both carney's knees swelled during the rehearsal, but always the tough guy filmed the scene without saying a word. Once the scene was shot he called Hope into his dressing room ,both were shocked to see his knees filled with fluid. easily twice their size,they were back to normal within a week.